since our latino party in january i’ve become a bit obsessed with quesadillas. initially we had them to use up a pumpkin and cheese mix which was leftover from a batch of empanadas. having found out how easy they are to make (i’ve always defaulted to the roll-your-own approach with soft tortillas) i pulled out an allegra mcevedy recipe i bookmarked last year for spicy black bean quesadillas. as well as being easy to assemble these have the advantage of only taking 5 minutes to pull together the filling, which mostly uses store cupboard ingredients. since then i’ve made a batch of spicy bean quesadillas each week, using different beans depending on what i have in. for me, what really makes this dish is the pile of avocado salad which is place on top of the quesadillas when serving. this adds a dose of healthiness and freshness which is perfect for ushering in the spring weather which is finally arriving. in a bowl, mix together the black beans, cumin, oregano, chilli, sliced spring onions, chopped pepper, grated cheese and chipotle salsa until well combined, using your hands to squash the beans. season to taste with salt and freshly ground black pepper. brush one side of the tortillas with a little oil and then rub the other with the cut sides of the garlic clove. with the garlicky-side facing up, put a layer of bean mixture on half the tortilla then fold the other half over to make a half moon shape. press down to squash everything together – this helps keep the filling in place! heat a non-stick pan and add your quesadillas (i can fit two folded quesadillas in my pan) and fry for 3-4 minutes on each side, pressing the quesadillas down from time to time using a spatula, until the tortillas are crisp and golden-brown on both sides. remove from the pan carefully and keep warm. repeat the process with the remaining quesadillas. meanwhile, in a small bowl, mix together the avocado, tomatoes, rocket/coriander and lime juice. set aside. 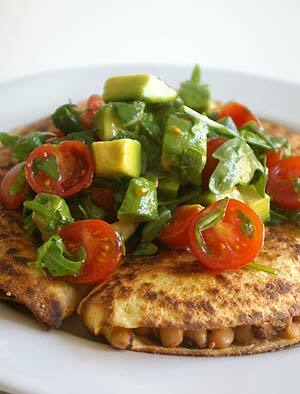 serve the quesadillas topped with the avocado salad and pumpkin seeds.